The Pulse of the City Customer Satisfaction Award honors those companies earning the top ratings for customer satisfaction. Effectively promoting this honor contributes to the development of a brand of excellence, attracts new business, keeps customers coming back, and motivates staff and management. Your reward for earning the award is an opportunity to build immediate confidence by sharing the news of our independent research confirming your high customer satisfaction. It distinguishes and differentiates you from your competition. Use what you have! You earned this award! Spread the news! Our marketing packages have the tools you need. Our customer care specialists can work with you to best tell your story. A press release can get you to page one in search engines, our window decals can welcome visitors, our enhanced award page will direct people to you and help tell your story, and more. Simply placing the award image on your website, social media sites and in your emails announces your award status and credibly affirms your superiority to readers — both existing customers and new prospects. And best of all, you earned the right to your award status. The Pulse marketing tools are cost effective and affordable. They offer an inexpensive way to brand your business and spread the word, and include tools usually reserved for big business. 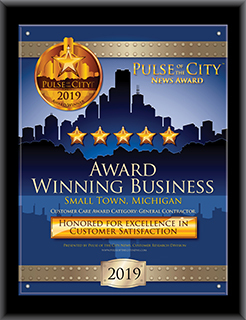 The researchers, writers, editors, publishers and staff at Pulse of the City News encourage you to take full advantage of the benefits that come with your status as an award winner. We congratulate you on your high customer satisfaction rating and encourage you to browse our site to learn just how many ways the award can help your company.